I’ve been working with both adults and children for more than 20 years, helping them to develop as speakers and listeners; promoting the Art of Storytelling as an instrument of instruction. Recently, I was working in a classroom with a group of 11 and 12 year olds. I’m always attempting to make connections between my lessons and current events. My objective is to, not only teach, but also inspire. I believe in my work. Anyway… I was working with this group of 11 and 12 year olds and decided to share with them the story of Malala Yousafzai, the 15-year-old Pakistani child whose life was nearly taken by an assassin because of her impassioned advocacy for the education of young girls. I was speaking to my students about being vocal, standing up for what they believe and releasing fear. I was attempting to put their lessons on public presentation in perspective. 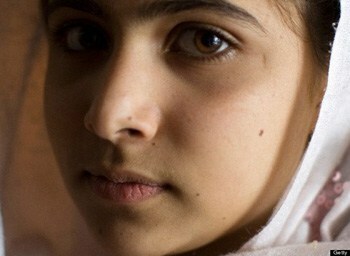 I wanted Malala’s plight to inspire them as it has me and so I spoke with conviction and passion. After letting them know that Malala had been shot a few weeks ago, on October 9th, their eyes grew wide. I felt that I had finally gotten them to a point of immersive listening, they were with me and, I believed, we were sharing a path of compassion for Malala’s desperate plight. In no way shape, or form, was I ready for what occurred next. Many of the children’s hands shot up in the air, anxious to ask questions. I was excited! They were finally completely engaged! It is typical for youth to blurt out when they get excited. I’m used to managing the classroom when this happens, but I wasn’t prepared for the macabre nature in the tone of their questioning. He was looking right at me, and the thing that knocked me off balance was that he had a wide, almost deliriously happy smile on his face. I couldn’t avert my stare away from him. I stood there for, what had to be a few minutes, staring into his face. He didn’t look away. He wanted his question answered and he had a level of excitation in his desire to know that left me feeling a sort of queasy. I didn’t answer his question. I looked away at other students and continued the discussion but nothing felt right from that point on. There felt like, to me, a ghoulish interest in wanting to know the details of her experience. I re-directed our discussion to where I thought we should head. I realized that there were few in the class that shared my compassion for Malala’s plight, they were more interested the gory details of her attack. Yes, I did ask questions of them. Deep, penetrating questions but these led even closer to despondency with their reactions and answers. I tried not to let them know that I was disturbed and used the rest of my class time with them to talk about traits of character such as compassion and empathy. This wasn’t the direction that I had planned for our discussion to go, but it is where we ended up. It is what was needed in the moment and I had to be willing to adapt to meet their immediate needs. I’ve spoken to a few others about this issue. The consensus seems to be that “our” youth have become desensitized to violence, that they have been inoculated against realizing the horror experienced by others. Is it just me, or is there something incredibly disturbing about the reaction these children had to Malala’s pain?